The Short-toed snake eagle (Circaetus gallicus Gmelin, 1788) is considered by most of the European ornithologists as one of the most beautiful raptors of the continent. An elegant livery, a regal posture, a powerful eagle flight, sparkling eyes and dimensions that by sure do not go unnoticed. Perhaps it’s the customary alimentation that may be contrasting with its genetic beauty, seen that it nourishes almost exclusively of snakes with a modality we shall describe later on, but this fact is overshadowed and by sure its other virtues do prevail. Taxonomically, the short-toed snake eagle belongs to the order of the Accipitriformes and to the family of the Accipitridae. Already from the etymology of the scientific name we note that Gmelin, the one who has classified it in 1788, wanted to highlight its elegance placing it between an eagle and a hawk. In fact, the genus Circaetus comes from the Greek “kirkos” = hawk and “aetos” = eagle, whilst with gallicus he did identify the Gaul, the old name of France, the place from where did come the specimens he studied. It is however today ascertained the France is not by sure the place more frequented by this raptor even if it is present in a good number especially in the Mediterranean sector. Very many are the vulgar names given in Italy to this bird, this to signify the different interpretations the various observers wanted to give by interpreting the popular tradition. Aquila gallica, aquila dei serpenti, biancone, aquila astore, aquila bianca, falcone delle steppe. 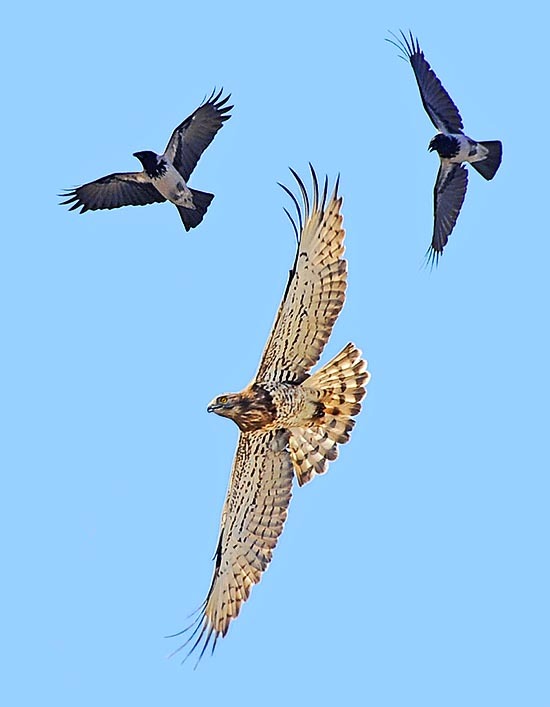 Also in the rest of Europe they have indulged in giving names of different etymology: in English, Short toed (snake) eagle; in Dutch, Slangenarend; in French, Circaète Jean-le-Blanc; in German, Schlangenadler; in Spanish Culebrera europea or águila culebrera and in Portuguese águia-cobreira or guincho-branco. Some have referred to the length of the toes of the feet, notoriously more reduced than any other raptor, others to their traditional prey and the French, with a fair level of imagination, have matched the nickname Jean, given in the Middle Ages to all acute and intelligent persons to le blanc, the colour of the livery. It is a purely migratory bird that reaches Europe by the end of March and leaves it after the summer period, already from August, but with a peak of concentration in September. 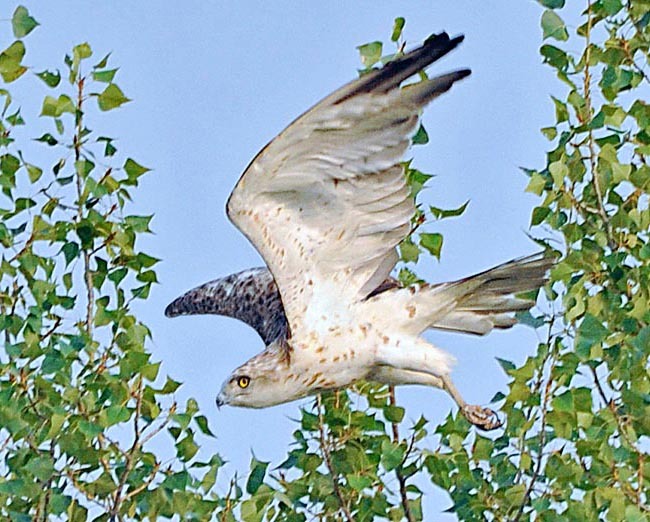 The short-toed snake eagle is a Mediterranean species therefore it does not go deeply in the north of the European continent even if touching in the only eastern part, the regions facing the Baltic Sea up to Finland. The most of the European population is concentrated in the Iberian Peninsula, with a good presence in South France, on the Italian Tyrrhenian coasts, part of the Balkan Peninsula and in European Russia up to beyond the Urals. It’s totally absent in central Europe, in England and in the Scandinavian Peninsula. In Asia, it occupies Anatolia up to Iran and Central Asia up to Mongolia. Small isolated colonies have been also reported in South-East Asia. In Africa is present and sedentary only in Morocco. The Europen and Central Asian populations are highly migratory with seasonal movements interesting Africa for the European strain and India for the Asian one. Some reports have confirmed Sicily as well as some temperate Iberian areas as zone of partial wintering of the European flux. The migration is sub-Saharan with an ample belt going from the Atlantio coast to the Horn of Africa and including all the regions of the Sahel. Already during the month of March the first nidifying specimens reach the reproduction territory with daily stages of about 100 km and perform the typical aerial and vocal parades for conquering the females. Conversely, only later on and on an ampler period do appear the subadults in their first reconnaissance trip and although being potential competitors of the adults, but not yet able to reproduce, have the possibility to transit unharmed and often to use the already occupied territories. In fact, it seems that the very white livery wrapping at times the juvenile body is a valid pass allowing them to be tolerated by the adults and to freely take advantage of their territory. The young remain mostly in the hibernating area during the first years of life and only by the fourth year they reach the sexual maturity. 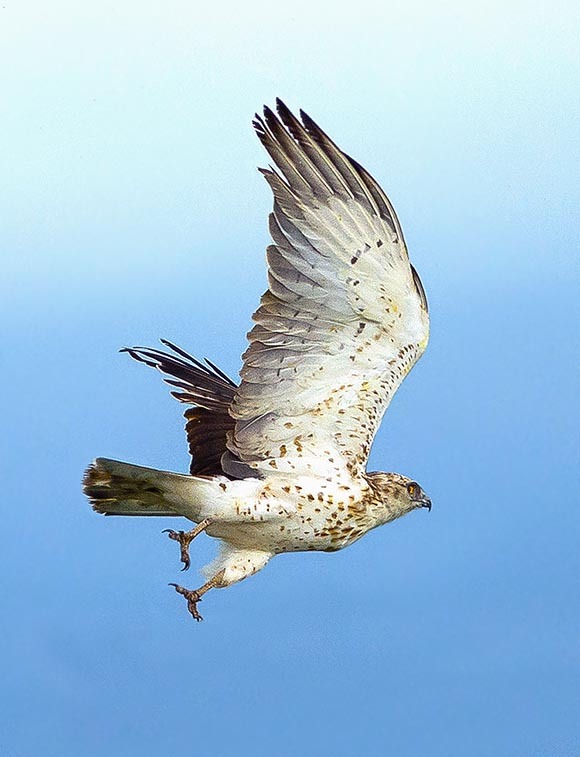 The short-toed snake eagle is an excellent glider and takes advantage from this capacity for identifying the preys. It is one of the few raptors capable to perform the “Holy Spirit”, a modality allowing the bird to keep suspended and motionless in the air with rapid wing beats and a modulation of the tail, so much to allow him to sight the prey on which to pounce. 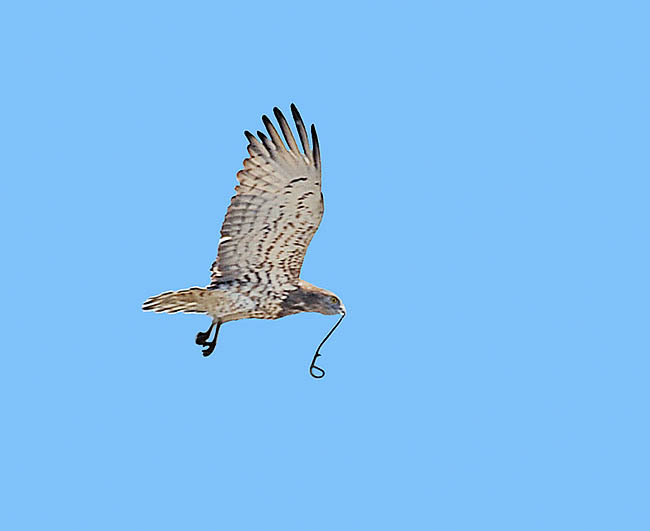 Whilst in the falconets this operation is done at few metres from the ground, the short-toed snake eagle, by means of an eyesight deemed as one of the sharpest among the raptors, can afford to stay at various hundreds of metres from the ground. It is unbelievable how it may sight a snake coiled in the bushes at such a distance. This capacity of gliding is granted by a remarkable wingspan and an extension of the wing that gives him an optimal aerial bearing. The gliding is much used during the migrations when, once reached a remarkable altitude on a thermal, allows him to glide for tens of kilometres without a single wing beat. It is a quite social bird during the migration and often in some now customary places (Gibraltar, Southern France, Liguria) can be seen tens of these birds coming from the see gliding in group high in the sky. The short-toed snake eagle frequents the semi-desertic steppelike areas, the garigues covered by sparse thicket or by Mediterranean conifers, place where liver and abound the preys he nourishes of. As a mater of fact, the presence of snakes is essential for his survival. Even if nourishing almost essentially of snakes, in the Mediterranean zone it regularly hunts the ocellated lizard (Timon lepidus), some small bird and, rarely, some small rodents. It is thought that the nuimber of snakes seized by a single indiviudual exceeds the 400 units per each reproductive season, what leads to a daily average, calculating their summer presence in 5 months, to about three specimens per day. It does not pay by sure attention to the size or the poisonousness of the preys, against which it is not immune, but it has been ascertained that the snakes over the metre stand among the choice preys. Where their ranges overlap, the Green whip snake (Hierophis viridiflavus) stands among the chosen ones, but other whip snakes very frequent in the arid zones visited are not ignored. For example, in the Iberian Peninsula they preferentially hunt large snakes, such as the Montpellier snake (Malpolon monspessulanus) or the Ladder snake (Rhinechis scalaris). The capture takes place swooping on the victim from above and landing directly on the reptilian or very close to it. It reaches it running after it and snapping it for the head until it is unable to escape. It often uses strong wing beats for stunning the victim. The animal is gulped down whole by the head and often, seen the vitality of the snakes, the prey is vomited several times and swallowed again until when it becomes unharmful. It is not rare to see short-toed snake eagles flying with parts of the snake, especially with the big specimens, still hanging down and shaking violently. The short-toed snake eagle is an elegant but powerful bird in its morphology. It reaches the length of 70 cm and a wingspan at times close to the 2 m.
It has a powerful and majestic flight and is quite similar to an eagle. The unexperienced observer initially may mistake it with a Pern (Pernis apivorus) or with an outsized Buzzard (Buteo buteo), but with more attention the species is rather easy to classify. The base colour of the young and of the subadults is totally white when seen from below, with a slight marbling, a brown dotting and a light collar of reddish cream colour. The upper part is always greyish with a strong black bar on the tail. The adult has black head with the body and the underwing white finely black striped. The beak is robust and grey. 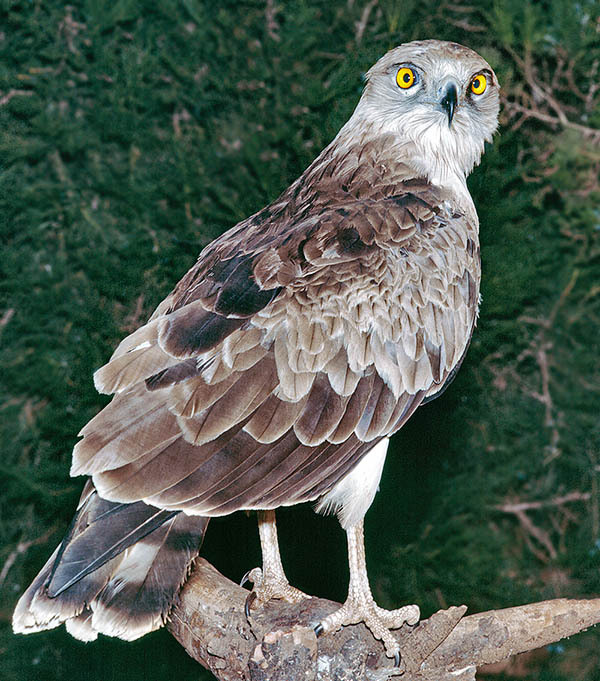 Particularity of the short-toed snake eagle is to have a head that makes it look like a night bird as the very frontal eyes allow a perfect binocular focusing. The eyes have a quite beautiful orange yellow and highly standout on the variegated livery. The paws have fairly short toes, hence the English vernacular name, and tarsi that besides being featherd, are furnished of very coriaceous scales to resist to possible bites of venomous snakes. There is no sexual dimorphism apart in the dimensions that are slightly greater in the female. Some much similar species have been identified and are by some still considered as subspecies of the Circaetus gallicus. They are African resident species sharing the hibernating area of our short-toed snake eagle. These are the Circaetus pectoralis, the Circaetus cinereus, the Circaetus cinerascens and the Circaetus fasciolatus; they all live together in the eastern and southern part of the African continent whilst the Circaetus beaudouini is present also in the western part. The short-toed snake eagle nests in wood zones, preferably on trees located on steep and craggy slopes. Usually it choses Mediterranean conifers and the nest is built centrally placed on the highest branches at an height usually of a few metres, but that, at times, this may exceed the 30 m.
The nest is always placed in a sunny and dominant position and often oriented directly southwards. It’s a structure of about one metre of diametre formed by branches and covered with leafy branches and twigs that are often renewed and integrated also during the hatching. If compared with the size of the subject, the nest reveals fairly small. The short-toed snake eagle lays only one egg of about 70 mm of length, white, that becomes slightly amber and dirty during the hatching. The incubation varies from 6 to 7 weeks and is done only by the female who, during that time, is nourished by the male who keeps constantly close during the whole period. The young remains in the nest for about 70/80 days during which the female feeds it with love with the food taken by the father. During the first weeks of life, the snake regurgitated into the nest by the male, is dissected by the female into morsels and fed to the chick. Quite soon, after only one month of life, this is able to swallow whole snakes in one bite only. From that moment, the hunting is done by both parents but they are always attentive to the son left in the nest. 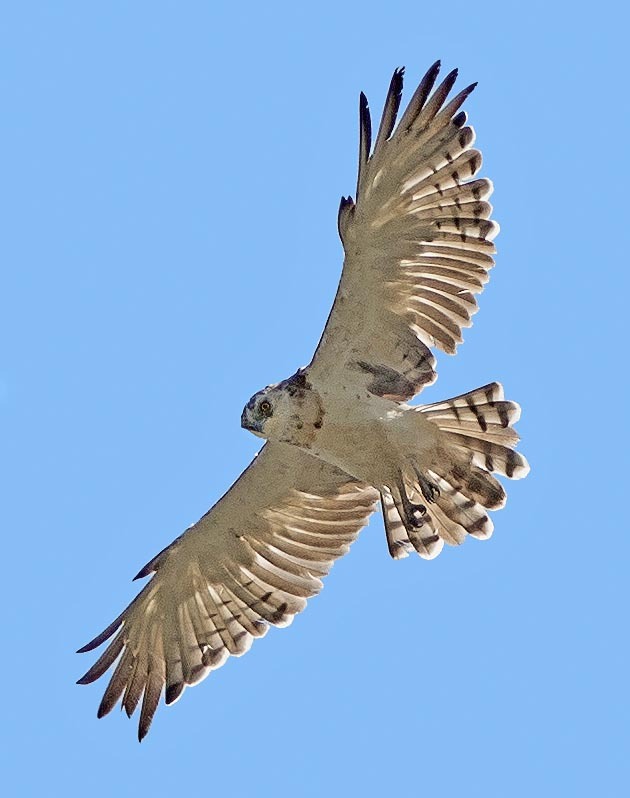 The short-toed snake eagle is not a very vociferous bird and only during the courting and the delimiting of the territory emits a series of vocal manifestations while flying over the area chosen for the nesting. It is very constant in the choice of the nidification place coming back often to reproduce not far away from the previous nest and in any case not abandoning the area chosen previously. In Europe it is a species considered as rare and subject to strict numerical control even if recently it has been noted an increase of the population and an expansion of the nesting areas. It can reach the 20 years of age. It has not many natural foes when adult but the poaching, especially during the overflights of Malta Island where it is often decimated during the migrations.